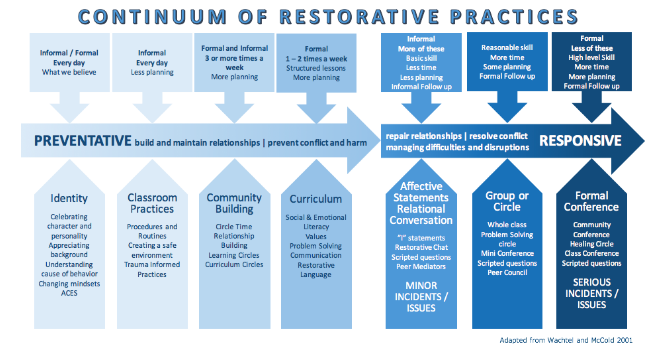 Restorative Practices/ Approaches are on the less structured end of the Restorative Spectrum whereas Restorative Justice is quite structured and formal. In Restorative Justice we are working to repair a harm that has happened. Restorative Practices (RP) help us prevent the harm from ever happening in the first place. With RP we are using an approach to others that is focused on people and relationships so we can nurture strong, healthy and vibrant connections between our families, peers and community. RP increase the mental, emotional and physical health of everyone who uses them. We build our resilience, our emotional literacy and regulation skills. We become more empathetic and feel valued in really important ways. Communities that embrace RP have lower crime, lower addiction rates, lower rates of mental health struggles, fewer suicides and a lot more civic engagement.